I wish I could spend forever designing the characters for Cross Hare’s world, but in this particular instance I had less than an hour to come up with the Maitre D’ for The Sandwich Club. From day to day, I sort of rework my dialogue and story over and over in my head. I had definitely imagined the Maitre D’, but I had yet to sketch him out onto paper. The character that I kept seeing in my head was the Hotel Maitre D’ from Ghostbusters. If you are familiar with the movie, he is the fellow who wants to refuse to pay the ghostbusters after they trash the ballroom of the hotel. When it came time to start sketching my character, I popped Ghostbusters in and did some sketches of the actor from the movie. At this stage, I’m not concerned about design, but just drawing what I see. I’m looking for details that stand out to me, or that I wouldn’t have thought of solely from my imagination. I noticed that a few times the actor lifts his chin above where his neck meets the base of his head. Also, his hair just seems like lumpy shapes around his large forehead. I’m just being very loose and gestural with my sketches, trying to get the feeling right. These sketches are literally just a way for me to take visual notes. My goal is not to make a caricature of the actor from Ghostbusters, but just to pick up on some of the nuances of a snooty maitre d’ character. To begin designing my character I sketch out some solid volumes in blue pencil and then add in facial features while referring to my sketches. 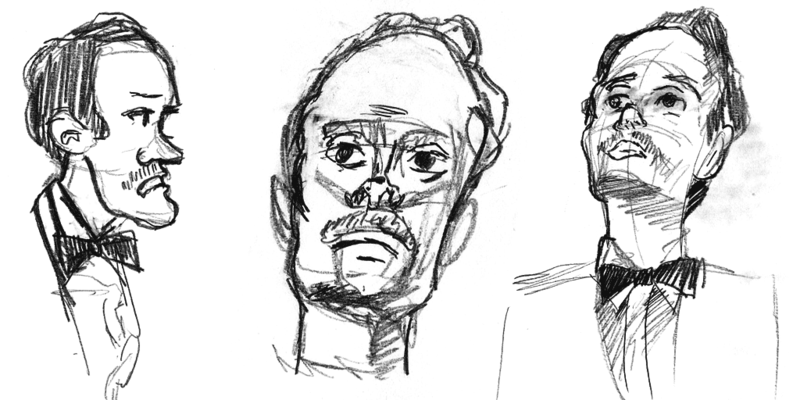 I liked how the cheek bones in one of my sketches sort of jutted out from the profile, also how the brow above the eyes stuck out similarly. Part of this process involves simplifying, I need to lose lots of detail to make my character fit into Cross Hare’s cartoon world. Working with the blue pencil first, gives me a chance to simplify things further with my black pencil on a second pass. I did a couple quick designs, and I liked the one where his eyelids were large and raised, with his eyes just peaking out from under them. And that was pretty much it; a character design in less than an hour. I didn’t really have much more time for exploration. I still had that night’s comic strip to plan out, write, draw, scan, and edit… in about 4 hours time. So the next time I would draw my Maitre D’ would be in the final strip. Oh! 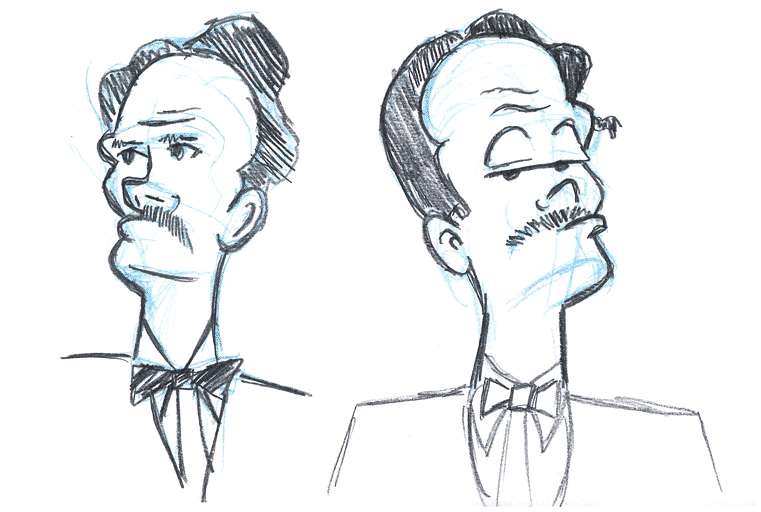 And I didn’t forget the trademark of snooty maitre d’s everywhere: the thin mustache. Click the image below to see the first strip with The Sandwhich Club’s Maitre D’! Wow, before I read your commentary I said to myself, “It’s that snooty hotel manager from Ghostbusters!” Great job, man.